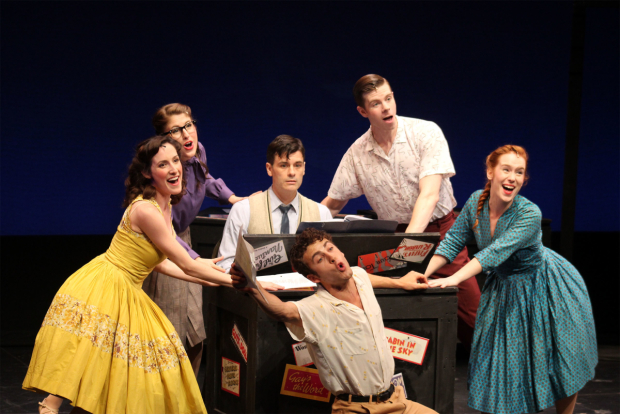 I felt more than a bit self-conscious at last week’s NYMF performance of What Do The Critics Know?, The show’s title and its basic premise shine a glaring spotlight folks like me who presume to know what artistically works and what doesn’t, but fail to produce any creative work of our own. There were a handful of moments where I double-checked to make sure my large manila press packet, a give-away of my special status, was extra hidden under my seat. Overall, however, this new musical written by Matthew Gurren and James Campodonico gets at least one thing right about critics: deep down, beneath the sassy one-liners and the cheap alliterative headings (critics have critics too), there’s a pure love for art. Maybe with a bit of money, luck, and inspiration, we might be able to create our own show, but the fact of the matter is our strengths lie elsewhere: in our passion, our capacity for critical and abstract thinking, our expression, etc. And if we were to try to do what artists do, we would probably fail miserably and fail often. When yet another one of his plays gets panned by the critics, writer Nathan Wood (a glumly loveable Chris Gleim) has to resort to waiting tables in order to pay the bills. His empathetic, but criminal boss Tony (scene-stealing Danny Bolero) sneakily drives Nathan to say what kind of revenge he’d like to exact on the critics, and when Nathan says that the critics should get their own show insulted, Tony uses his shady financial resources to blackmail the critics into creating their own production to premiere in the current Broadway season. The set-up is a wonderfully entertaining and includes familiar cast of characters. Any reader of theater reviews could immediately recognize these critics occupying steady positions in the world of cultural criticism. There’s the snobby Chester (Ryan Knowles), the New York Times writer with a penchant for overwrought vocabulary and irritability. Representing the Post is the flamboyant and maniacal Brad (Prescott Seymour). And lastly there’s Irma (Mary Mossberg) who, in writing, is just as cruel as the others, but whose failed career in dance (and failed relationship with Nathan) cloud her judgment. The trio are hilariously sinister but also warmly sympathetic, thanks in large part to the actors’ talents and likeability. In “Writing the Show,” each critic presents his/her own unique idea for their production, resulting in a number than effortlessly blends multiple musical genres, comic excitement, and excellent character development. We can see ourselves in their giddy, but inevitably doomed efforts. The plot loses focus in the second act, largely with the inclusion of too many subplots and secondary characters. Things start to stray when the critics hire two delusional character actors who believe themselves to be Shakespeare and Bach. Irma splits from Brad and Chester to work with Nathan, and there’s an unnecessary love triangle between them and Nathan’s current actress girlfriend. Brad and Chester’s Shakespeare/Bach production falls flat not only within the play itself, but also for us. Being able to see Brad and Chester shape a production from scratch should have been a hilarious prospect, but the madcap inclusion of one-note characters like Shakespeare, Bach, and a reigning diva result in a drawn-out, unfunny, and uninteresting resolution. And for a show that is so reflective on our understanding of art, I would have liked to take away a more evolved message on how our relationship to art differs according to where we find ourselves in its process. However, the musical’s brilliant first act, its loveable characters, and its solid talent were more than enough reason to feel great about this show and its future prospects.